Obama Campaign Unleashes Twitter Hounds On Congress' Republicans : It's All Politics The Obama re-election campaign unleashed the Twitter dogs of political war, Friday, urging voters to tweet Republican lawmakers to encourage them to compromise on debt-ceiling and deficit-reduction legislation. 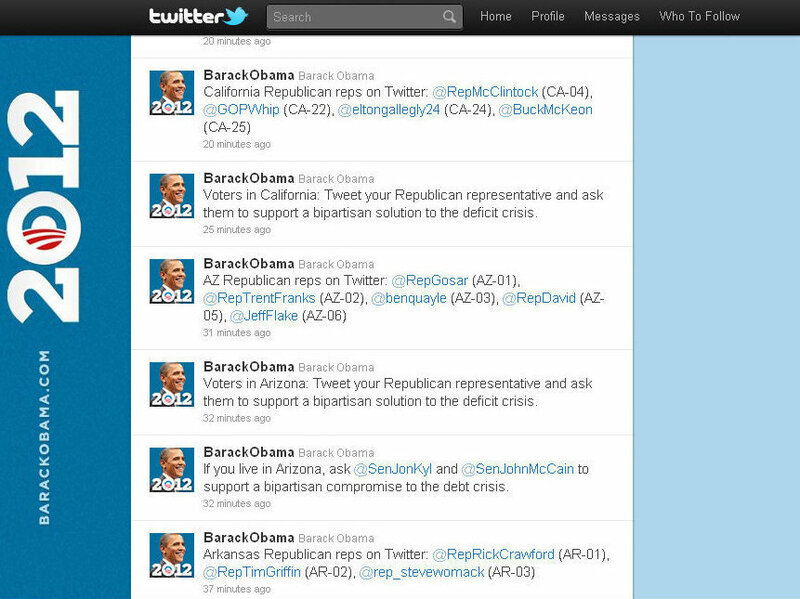 Obama Campaign tweeted lawmaker handles. Updated @ 7:10 ET --President Obama's @BarackObama Twitter account which is managed by his re-election campaign was "unfollowed" by almost 37,000 people in the Twittersphere, reports Mashable. Thousands of Twitter users were apparently put off by his campaign's tweeting of GOP lawmakers' handles after Obama urged Americans to contact Republicans and urge them to compromise in the debt-ceiling fight. The account has 9.3 million followers, however, which puts that 37,000 loss in perspective. President Obama's re-election campaign unleashed the Twitter dogs of political war, Friday, urging voters to tweet Republican lawmakers to encourage them to compromise on debt-ceiling and deficit-reduction legislation. In a Friday morning statement on the debt impasse, Obama asked voters to contact members of Congress. He didn't mention a hashtag but it was soon learned that it was #compromise. The Obama campaign also started tweeting by the alphabetical order of states like some Internet political convention, the Twitter handles of GOP lawmakers. This could be the shape of things to come. It's easy to envision a similar technique being used by the Obama campaign to repeatedly keep the pressure up on congressional Republicans over during the 2012 campaign. Similarly, some version of this Twitter campaign could and probably will be used during the presidential campaign itself.